It’s been years since Lil Jon’s last release, but he’s apparently still making music and collaborating with big names in doing so. 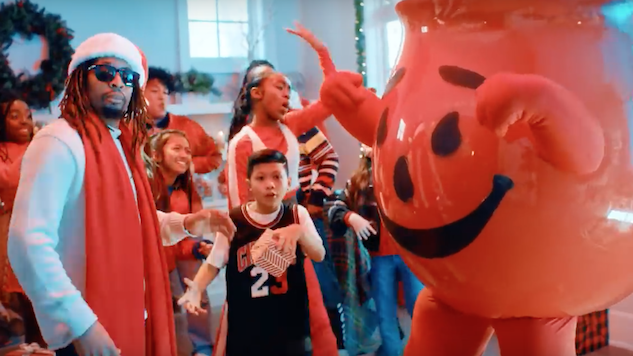 Released today (Dec. 18), Jon’s new Christmas single “All I Really Want For Christmas” features the Kool-Aid Man and gives a simple answer to the season’s most-asked question. Turn down for what? Nothing. What do you want for Christmas? Everything (on my list, baby). Donning signature shades and his holiday best, Jon settles down at a piano—presumably to dig into some Christmas carols—before an ominous booming noise announces the Kool-Aid Man’s arrival. The red pitcher bursts through the wall, because of course he does, and the party begins. With Santa DJ’ing and the Kool-Aid Man acting as his hype man, Jon breaks down his Christmas list, featuring a diamond grill, fly rims, a train set, a red Lambo, sneakers, speakers … the list goes on and on. Anyway, it’s truly so weird that this works—but don’t take our word for it. Check out the video below (unless you’re one of those people with a genuine fear of the Kool-Aid Man, which comes without judgement) and revisit Paste’s 2017 interview with Lil Jon here.